Our Listeners of the Week are Richard B. and Jeff B. for their donations, our 70 Patreon Patrons, Heath B. for talking us up to his calibrator, and Tue for offering to help us figure out why our website keeps exceeding its bandwidth limits. Check out Fearless Mobile Climbing for Tom’s mobile rock climbing wall events! In the news, Apple tvOS 12 was released and added Dolby Atmos support to the Apple TV 4K. People complained online about purchased movies disappearing from their iTunes libraries, and might have sparked a terms of service change. Nintendo Save Data Cloud requires Nintendo’s paid online service, only works with Switch, and doesn’t support all Switch games. And IMAX wants to release Netflix and Amazon original content in full-sized IMAX theaters. 0:19:04 Jeff B. gets the scoop on the one tiny difference between the TCL R615 and R617 TVs. 0:20:06 Travis D. wants to know why he’s seeing so much macroblocking on his new Samsung MU6000 TV. 0:23:03 Jon Z. asks if he should include an air gap behind the insulation in his DIY absorption panels. 0:26:32 Jeb B. wants a 75-inch TV for around $2,000, so we recommend the Vizio P75-F1. 0:27:28 Aidan C. gets a thumbs up to using Ascend HTM-200SE as Surrounds with other Ascend speakers, as well as a suggestion for Focal Little Birds as an alternative. 0:28:57 Brian P. is finishing his basement home theater. We talk seating distance, subwoofer size, Surround Back speaker placement, and Atmos speaker positioning. 0:35:19 Earle B. asks if Audyssey applies equalization below the automatically set crossover frequency, and we offer a response directly from Audyssey Labs. 0:38:35 Richard B. helped a friend finish a basement theater area in his house in Canada. We recommend Gibby’s for a Denon AVR-X3400H Receiver and Paradigm Monitor Series 7 Center 1, Surround 1, and Mini Monitor speakers, along with an SVS PC-2000 subwoofer, a low TV bench from IKEA or full-length TV stand. And we stress the importance of printed acoustic panels for his room. 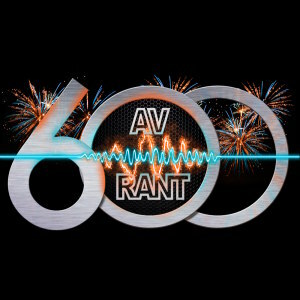 0:55:53 Infinite Gary gets our take on Krell trying to make a comeback, Christopher Nolan’s DGA survey to combat poor TV settings, and just what “air” means in the context of speaker reviews. 1:06:46 Adriano M. wanted to hear us talk about the 24.10.10 Atmos demonstration by Krix in Australia. 1:11:05 Dennis N. asks if the Xbox One is noisy when used as a Blu-ray player. 1:12:34 Jonathan S. has us elaborate on Harman’s CEDIA training for multiple subwoofers. 1:17:09 Karl R. wants to know if the new 4K JVC projectors have HDMI 2.1 and faster handshaking. 1:20:52 Alex P. wonders if using bias lighting with projection screens is a good idea. 1:25:31 Josh S. asks about the little-known Denon trade-in program. 1:27:52 Andrew T. wants to know what a DIN frequency extension rating means, why we recommend setting an 80Hz crossover even when your speakers are able to play lower, and why we say to use the LFE setting for the subwoofer output on your Receiver rather than LFE+Main. 1:37:48 PJ has a Denon X2200W with seemingly dead HDMI outputs, and he just wants to check if there’s an easy fix before he calls Denon. 1:40:54 Brian F. has a huge basement, and he wants on-wall speakers that will work nicely with his RBH speakers, so we suggest the Focal Super Birds since he can’t easily get the RBH Ultra-1. 1:43:32 Weldon B. gets our recommendation to shop for Vizio TVs at B&H Photo even though he’s in Canada thanks to their excellent Canadian shipping system. 1:46:53 Chris M. asks if he should get a calibrated SPL meter along with his calibrated UMIK-1 from Cross Spectrum Labs.